MaryKate Hanchett, in blue, stands near the super computer at Kansas State University. 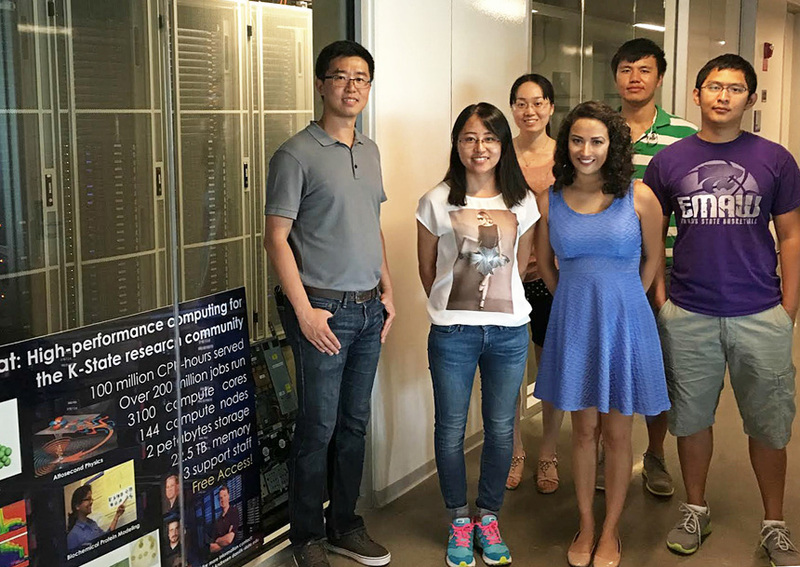 She did coding and computational modeling while doing research for Assistant Professor Bin Liu, at left, during her REU (Research Experience for Undergraduates) last summer. Hanchett is surrounded by the PhD students also working for Liu. Two summer research experiences have furthered MaryKate Hanchett’s desire to pursue a career in chemical engineering. The first was during high school, when the Fairport, New York native was accepted as an intern at the Laboratory for Laser Energetics at the University of Rochester. She worked with senior scientist Walter Shmayda on a project studying the optimal conditions for a nickel catalyst to absorb oxygen as part of a process to regenerate spent tritium fuel. The second experience came last summer when she participated in a National Science Foundation REU (Research Experience for Undergraduates) program at Kansas State University, working with Bin Liu, an assistant professor of chemical engineering, on a project with applications for alternative energy. So she spent her summer in Manhattan, Kansas, doing computer coding and modeling for an electrochemical catalytic process for converting furfural – an organic compound derived from plant husks and stems, sawdust, pulp, and other agricultural and manufacturing byproducts – into biofuel. The computer modeling allowed the team to test different catalysts, and use density functional theory to “find the most energetically favorable geometric configuration of molecules.” Her work contributed to a paper she co-authored, "Practical principles of density functional theory for catalytic reaction simulations on metal surfaces – from theory to applications," which was published on March 24 in Molecular Simulation. But in addition to research, the NSF-funded REU also emphasized public outreach and education. Hanchett spent time in local classrooms and community meetings, “explaining how living sustainably can benefit you at a personal level, including your wallet, your family, and your health -- and encouraging the community to put more time and effort into living sustainably,” Hanchett says. Hanchett is the first in her family to pursue engineering. Math and science interested her all through her schooling, she says, and some influential chemistry teachers in high school got her particularly excited about that field. Hence her interest in chemical engineering. She’ll be back this fall pursuing a one-year master’s as part of the GEAR program, then will pursue a career in an industry setting before deciding whether to eventually go back for a PhD for industry research and development.